Update: This study schedule is available in a redesigned, printable version! For those who are focused and ambitious, the 30-day study guide plan is great, as long as you have the time to put in. If you feel that life will intrude in one form or another, or if you need to improve your score by hundreds of points, then this guide for the Revised GRE may not be for you. (Not sure how much you need to improve your score? Review our post, What Is a Good GRE Score?) Remember, this is an aggressive plan, and you will need to be able to dedicate, on average, 2-3 hours a day. Also, if you are a geometry whiz or a reading comprehension guru, feel free to skip the sections you know you don’t need to review; the guide can be customized to your strengths and weaknesses. This is a general, weekly version of the 30 day study guide—if you’d like a more detailed, step-by-step daily breakdown with more of a focus on math basics, you should use the daily version of the 30 day schedule. Do you have longer than a month to study? 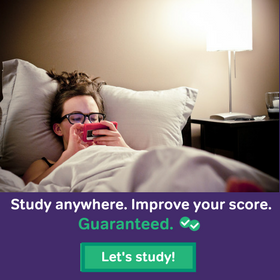 Check out our other GRE study plans! This schedule is different from the 1-month schedule provided within a premium Magoosh GRE account. We recently added those schedules within Magoosh; they’re modified to use only Magoosh material and have a slightly different order of assignments. If you have Magoosh already, you can simply use the schedule on your Dashboard to study—don’t worry about the version of the schedule detailed here! But if you started your GRE prep with a schedule on our blog (like this one! ), that’s okay too. Both the schedule on the Magoosh dashboard and this blog schedule will get you through everything you need to know on the GRE. If you prefer to take the practice test on paper, you can print out ETS’s practice test PDF. Take note that the PowerPrep software and the paper-based test have overlapping material, so it won’t be of much help to do both, unless you space them out far enough so that you won’t recognize the questions and answers! I recommend using PowerPrep Online if you can, since taking the test on a computer is a better simulation of test-day conditions. Also, PowerPrep comes with two tests. The PDF is only one test, which overlaps with Test 2 from PowerPrep Online. Magoosh’s online GRE Vocabulary Flashcards and GRE Math Flashcards. They’re free and you can use them on the web, on your iPhone/iPad or Android! This page includes instructions on where to find good full-length GRE practice tests, and how to take practice tests and incorporate them into your studies. 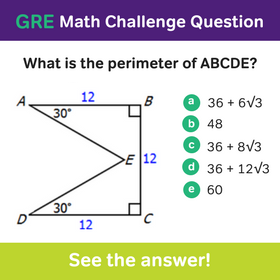 This page also has links to Magoosh’s free GRE diagnostic quizzes. Practice concepts seen in lesson videos by using the Magoosh “Quiz” feature. Watch about half of the Magoosh Reading Comprehension lesson videos. Write a quick summary or review of one of the two articles you read, threading GRE words you learned that week (can come from any of the sources, e.g. lesson, questions, etc) and apply them where appropriate. (Exercising your writing muscle will also hope with AWA). Practice the first four decks in the GRE Math Flashcards. Review a little each day. Finish watching all Verbal lessons in Magoosh. Read two articles. This time, make sure the content is different. If you read something from science last week, focus on business. Or history or social commentary. Write two reviews this week. Remember to thread in any GRE vocabulary words you have learned since beginning of this study guide. Take Practice Test 1 from the GRE Official Guide 2nd. edition. Review your mistakes by watching my videos. For those who are very ambitious, or looking to score above 80%, also take a Manhattan GRE online practice test (these tend to be sightly more difficult than the actual GRE test). Practice the next four decks in the GRE Math Flashcards. Review a little each day. Take a full-length PowerPrep Test (Test 2). For high scorers, take another Manhattan GRE practice test (two if you are very motivated). Finish going through the decks in the GRE Math Flashcards. Review a little each day. Create mock tests from Magoosh, doing 20 questions at a time for a mock verbal section. Get your timer and give yourself 30 minutes. Even if you’ve seen questions before it doesn’t matter. Do them again. Keep reviewing the GRE Math Flashcards, a little each day. Good luck… and remember, I’m always just a click away. Let me know whenever you have a question! Questions about the schedule? If you’re a Magoosh Premium GRE student, send us an email at help@magoosh.com. Not a Magoosh student yet? Leave a comment on this post, and we’ll get back to you. Thanks for such a wonderful and quintessential GRE blog,I have been reading articles from New Yorker, but from AWA & RC perspective which section of articles would you suggest for reading.I really get confused with so many sections offering articles with eclectic information.It would be really helpful if I knew to cull one or two articles from a particular section. Oh thanks a lot Rachel,thats pretty neat and precise. By the way, I have to say that I didn’t study hard until 3 weeks before the exam date, so I can’t blame anyone but myself for not start studying hard at an earlier date. I just took my GRE General Test today, and I was disappointed with my scores. I am desperately in need of help! This was my second time taking the GRE, but I only scored 155 and 156 in verbal and quantitative sections, respectively. I felt stupid about myself, because these scores were roughly the same as last year’s. For some reason I just couldn’t make it to 169 or 170, which are my target scores. (I have to admit that due to my full-time job, I couldn’t devote the whole day everyday to studying for the GRE.) Could you please tell me how I can reach my target scores? Without knowing exactly how you approach the math and verbal section, this is a tough question to answer. So while I can give general advice, which will hopefully help :), I can’t dispense specific advice unless I have a better sense of your weak spots. One way to remedy this is to let me know why you think you scores were in this range. Were these scores similar to those from your practice tests? What were you getting on the magoosh diagnostic? If you did take practice exams, did you take the PowerPrep 2.0 ones. Of course a host of other questions abound. How much were you studying each day? How were you studying (were you doing a bunch of questions, were you only watching lesson videos, did you use other sources besides Magoosh). In short, I’d love to help you conquer the GRE beast this time around, but in order to do so I need to get a better understanding of how you approached your prep. Thanks for your reply. Honestly, I didn’t spend a lot of time studying for the GRE, and I wasn’t using any Magoosh material last time. For quantitative part, I only did 2-3 practice sets 2 days before the exam. As for verbal, I spent about 3 weeks (not everyday during those 3 weeks though) going through the material from ETS, Kaplan, and Barron’s. (I’ve a copy of the first and second editions of the ETS study guide each.) I have a full-time job during the day, so I can only study in the evenings and on weekends. I haven’t tried the Magoosh diagnostic test yet, and I didn’t take the PowerPrep 2.0 ones either due to computer technical problems. (I am getting a new laptop in a few days.) I have scheduled another test in mid-October, and unlike before, I am studying for the GRE EVERYDAY now. What study plan would you suggest me to take? I would recommend the 2-3 month plan, which will have you ditching Barron’s and especially Kaplan. So lots of in-context reading, on top of the usual GRE study plan (Magoosh, MGRE practice tests, etc.) will help test day. Of course the drive to study every day will be a major factor. So keep me updated on your progress :). I have about 45 days to my test. I took GRE last November. In old scale my scores are: Q:800, V:330, W:3. I am not native English speaker but have studied in for two years in an English speaking university. I wanted to know what is your suggestion for me to improve my verbal score as much as possible. I don’t think I need to study math (maybe 3-4 days). But my verbal and writing score are really poor and I want to improve them. If I can devote 5 hours a day how much do you think, I can improve my score (assuming I follow your guidance and use your product)? Can I have a verbal score like 500? If you spend the next 45 days diligently working on your vocabulary, I am fairly confident that you can reach–and perhaps even break–500. A good place to start laying the groundwork is by reading our ebooks. You’ll find helpful tips, study schedules, etc. Let me know how the prepping goes and if you are making steady progress. 1. You mentioned that you teach 25 words a day for your students. What is your method? Do you teach them in context? 2. Must I start to do the tests from beginning? 1. It is a combination of in-context (which is usually a test question) and having students try to use the words in sentences. Pop quizzes also help to job intractable synapses. 2. Which tests do you mean? Thanks again. I meant must I start answering GRE question right now? or try first to improve my vocabulary first and then start to do test questions. You should start doing a combination of the two. Remember, you can learn new words as you go through practice questions. Simply use an online flashcard app. such as quizlet.com. Hi chris, your post is great 🙂 i have given my gre but couldn score well in quants…i have practiced from NOVA and given kaplan Mst’s..could you suggest more practice options for me…?? i want atleast a 12 point increase in my quant score…. Have you used Magoosh yet? Together with MGRE (esp. it’s practice tests), Magoosh makes for the best prep out there. A 12-point increase can be yours :). 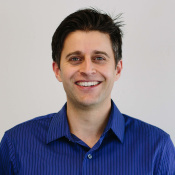 Hello Chris, I registered last month as a student, I have booked my GRE appointment for July 20 and recently took the manhattan GRE mock test and scored 284. I need your advice on what to do to achieve my target score of 315 at minimum. Test date is August 20 and not July 20 as stated above. i would like to ask u one que that …for the quant section i did barrons ,ets GRE ,1014 princeton review, grubers ……….is there any necessary to read further more books …or can i go with my revision ………..
really u r an awesome one i have seen…first of all thanks for guiding…n regarding me my GRE date is on 13 august ….so,, for the quant i have studied barrons new gre ….and the offical guide from ETS….so,bt still i lack in my confidence ….b,coz the every time i see a new problem on fb….i am scared and unable to answer some tough ones…wat should i do for this??? and for verbal , i am with barrons ,kaplans high frequency words? Thanks for the positive words :). I took the GRE yesterday, and for some reason, the first math section seemed really difficult. The wording of the problems were convoluted and the problems themselves seemed different from what I have studied. Does the test get more difficult as time passes? Do they change the question pool every month, because I am planning on taking it next month again. I have been using Magoosh for over a month, and I love it, but yesterday’s test really threw me for a spin and now I feel as though I won’t be able to score in the 90th percentile like I need to and I honestly don’t know how to study for interpreting crazy worded questions. Thank you for your insights. I have not taken the test recently, but you are not the first student in the last month to mention convoluted word problems. I am not sure how often the GRE changes its question pool. I think I remember reading that they do so every couple of months, but I can’t seem to find anything to corroborate this. Perhaps, in our next product improvement, we will include more convoluted word problems. For now, I would not despair. Continue with the product questions. Also pick up a copy of one of the Manhattan GRE books. Doing so gives you access to 6 free online tests. Simulating the grueling experience of taking the GRE as much as possible will definitely help you test day. Finally, you’ve inspired me. My next math post will be convoluted word problems. I will go out of my way to create some really difficult convoluted word problems. Hopefully, I’ll get that out in a couple of weeks. Sorry for the harrowing experience, but let’s work together to help you break that 90% barrier your next time around :). lost the opportunity to GRE. Please suggest any solution. Thank You. I am sure there is something you can do, as there is no reason you should be barred from the GRE based on an issue of spelling and caps lock. My advice is contact ets.org or gre.org itself. Send the site administrator an email and let that person know your predicament. Let me know if that works, and if not we can brainstorm another approach. Thanks for the advice chris i’ll try it right away. 1) How would you recommend I make the best use of the product with relation to verbal? Also, in my product it says around 368 verbal questions to begin with. Do the tests also borrow questions from the same 368 set or are those questions different? 2) Secondly, I find that I need to work on my vocabulary. Some of my friends seem to be using the 3500 Barrons word list. Would you recommend the same? or do you proposa an alternative? The mock tests, which of your own making, include the same questions. The good news is we will soon be releasing a spate of questions, about 150 total. That should definitely boost the number close to 500. For using the verbal section, make sure to not only do practice questions, but to learn the words contained in those questions. You should also build your vocab in general. In my vocab ebook I expand on this. As for Barron’s 3500, I wouldn’t necessarily recommend it for the New GRE, which requires more of an understanding of words in context. (I elaborate on this in the ebook). Hey, I am planning on following the plan given above. I just had a question regarding what source you suggest to learn the 150 words per week. Thanks. I’ve been studying for verbal thru Magoosh for about 3 months. At this point, I’m scoring around 160 on mock exams thru Manhattan and Magoosh. I’d like to get my score up to 165. I have 4 exams left to take thru Manhattan, and I’ve worked through the Manhattan verbal guides and all of the Magoosh questions/videos several times. I’ll take the two tests from the official guide as soon as I find a PC to borrow (haha). Do you have specific tips for increasing my score from 160 to 165 (or higher, of course)? I’d like to study/prepare more before I use up the rest of my practice exams. I’m only referring to verbal, by the way. A 160 is great! What’s even better is your aiming for the top mark. To really answer your question, I would have to know your strengths and weaknesses within the verbal section. But let’s assume each is one par and you want to ace all of them. For RC, pick up the Official GMAT guide and an LSAT prep book by LSAC. Those questions are challenging and will really help hone your RC skills. For vocab, become ravenous and devour as much vocab as you can. More specifically, know every word in PR Word Smart. For that matter if you can get your hands on Barron’s 3500 word list – ditto. (though the definitions are vague and sketchy at times. Cross-reference). Of course that is general advice – let me know if there are any specific areas in which I can help you :). My weakness is long RC passages, particularly if they’re science-based. The main problem is pace. I usually can answer the questions correctly, but not fast enough. I’ve even wondered if it would be a good strategy to guess or spend less time on the 3 to 4 long passage questions, which would give me more time on the rest of the verbal. But I’m not sure that gambling on 3 or 4 questions is such a good idea. (I think there’s just one long passage per two verbal sections? But if the experimental section is verbal then that’ll complicate matters.) I know I said 165, but I’d be content with a 162. Thanks for the suggestions. I’ll definitely look at the GMAT and LSAT guides, and continue to beef up vocab. Lastly, do you believe that my mock exam scores are pretty good indicators of how I’ll do on the real thing? Manhattan suggests scoring in your targeted range 3 times on their tests before taking the real one. Yeah, I’d say your scores on the Powerprep test is indicative of your score. 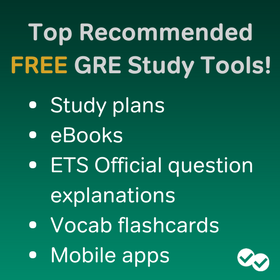 I forgot to mention this in the last post, but you should pick up a copy of the Official ETS Revised GRE guide, if you haven’t done so already. There is a practice test (and gobs of material) in there that doesn’t overlap with the CD. See how you do, and that should give you a good idea. (3 times is great – however there just aren’t too many legit practice tests out there). I would practice the science-based long passages in the GMAT, LSAT books. You WILL get better with practice. Skipping a few questions can be risky, but if it frees up time to focus on the rest of the section, this strategy may work for a 162. Let me know if you have any other questions, and good luck on the test :). Sounds good. Thanks for your help. Hey chris how r u. Wanted to ask if you can suggest a study plan for me, i’m scheduled to take my GRE on April 11, seems like i got a bit over a month but i don’t! . I’m a trauma ICU nurse and i do 3 12hour shifts per week and on my forth day im dead (so 4 days per week i cant study) that leaves me with about 2 weeks if any to study. i’ve purchased the barons review book, the kaplan book, your magoosh online program, and even the ETS official guide. what do u think i should start with and how to go about with trying to score well on this test. p.s. i started your program online and i cant believe how bad im doing on the math! i guess not using it does make u lose it. I would def. spend some time brushing up on the math fundamentals by watching all of the Magoosh lesson videos. Don’t do this all in one go, of course :). Watch a few videos, then make sure you identify your weaknesses and do practice problems relating to those areas. You can use the books you have to find questions that test a given concept. Two weeks is not a lot of time. So do not try to become good at just a few things, but have a basic grasp of most of the concepts. I actually meant word roots and you are right, they do not always give a hint of what a word might mean. Again thanks. What I only have 30 days for my GRE exams. Would you suggest I learn the root words for the verbal section? I am not sure what you mean by “root words.” Do you mean a list, such as Barron’s Essential 800? If so, I would say yes, that is not too ambitious. If you are ambitious, consider the 30-day study guide above. Of course cross-referencing the vocab words you encounter while reading is always helpful. If by “root words” you mean word roots, I would strongly suggest against doing so. Many GRE words do not conform to word roots; applying roots will only lead you to infer an incorrect definition. I think a great idea would be for you to go through the 2-3 months study guide (https://magoosh.com/gre/2011/2-3-month-gre-study-guide/) and focus just on the quant. Covering the quant alone in 40 days will be challenging, but I think that should be a great study plan for you. I’m interested in your product & a bit new in the GRE world! I just wanna ask : according what you wrote above in the essential material, Does this means that your premium product is not enough to master the GRE exam? To answer your question, I would have to know the person’s level and what you mean by “master,” e.g. perfect score or near perfect score. Regardless, you should avail yourself of the best resources out there. Magoosh, I believe, is definitely the best (at least for the price). And if I’d have to recommend one and only one resource for a student who wants to master the test, I’d recommend Magoosh. However, it always helps to have more practice material, especially ETS material. Thanks for all these great resources, your verbal videos are great! I am holding off on using the power prep software because I want to first utilize all the resources given by Magoosh and my other study materials so that I can get a much more accurate gauge of my performance. Are the questions in the booklet provide in this post the same questions as asked on the power prep software? So the questions in the powerprep software overlap with the questions that are part of the CD accompanying the book. The questions in the book, including those from the sets in the beginning, are different from any found in the powerprep software. Hi Chris, the post is awesome and very helpful. Please do let me know how many unique tests are there in POWERPREPII? How many full timed tests can we take in Powerprep, given that most of the questions don’t repeat again? Power Prep has only one full-timed test, unfortunately. Luckily that breaks down into two 25-question math sections and two 25-question verbal sections. The good news is you don’t have to buy the Power Prep CD because the on-line test (that you can download from the gre.org site) covers those exact same questions. The bad news is if you do all the questions from the on-line test, you can’t really take the Power Score test (you’ll have seen the questions already). I know, it’s pretty confusing. Here’s hoping that ETS releases more practice material.